This vegetarian baked beans recipe is easy to make in the slow cooker. See how easy it is to achieve all the flavor of old-fashioned baked beans, without the meat. We think these meatless baked beans, slow cooker style, might even make it onto your list of favorites. 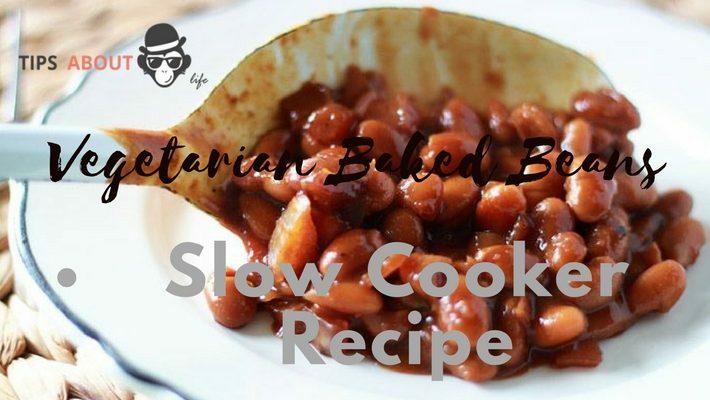 Vegetarian Baked Beans – Slow Cooker Recipe. The night before, pick through the beans to remove any stones, then place in a bowl and cover with enough water to cover the beans by two inches. Soak overnight. In the morning, mix together all ingredients except the beans, onion, and cloves in a large bowl. In the bottom of minimum 4-quart slow cooker, layer the diced onion, then add the beans*. Pour the liquid mixture over the beans, then add up to an additional 3 cups of water until the tops of the beans are just submerged. For extra flavor, take the reserved onion end and press 8 cloves into it in a circle. I used a skewer to make the holes before inserting the cloves. (I also used more than 8 cloves, which I think overpowered the beans a bit, so in the future I will be using less!) Place the onion end into the center of the beans. Remove before eating. Cook the beans on high for 6-8 hours, or on low for 8-10 hours. I left mine in the pot on low for around 12 hours (it was a long day), and as you might expect, they taste better the longer they sit. If vegetarian baked beans will be in the slow cooker for less than 8 hours, parboil them first for 30 minutes before adding them. If the cook time will be longer than 8 hours, there is no need to parboil.